The LNP’s plans to split the state’s electricity generators into three will raise state generation costs by 33 per cent – and is purely motivated by the party’s ideological obsession with privatising the state’s assets. Not4Sale Campaign spokesman Stuart Traill said the demerger of Stanwell and CS Energy into three companies would see an unnecessary 33 per cent increase in operating costs, despite the LNP claiming they would save more than $130 million over three years. Under the AER’s mandatory ring fencing guidelines each generator is required to be totally self-sufficient, requiring all the support staff and resources of a separate company. Mr Traill said he expected, if elected, Mr Nicholls would announce a budget emergency and immediately push to sell off assets if he was returned to government. “This is the man who wasted millions of taxpayer money to sell a plan to sell our state’s assets, and he is desperate to get back into power to finish the job,” Mr Traill said. “He has zero credibility on electricity prices given the record price rises during his term in government. How will Tim Nicholls pay for more than $22 Billion worth of campaign promises? Queenslanders concerned Tim Nicholls has no way to pay for the cost of the LNP’s campaign promises fear he is holding back plans to sell the state’s electricity assets until the last minute. The LNP have so far promised more than $22 Billion worth of policies this campaign, but Mr Nicholls again refused to reveal how they will pay for these promises in an interview on ABC Radio 612 this morning. Not4Sale Campaign Coordinator Stuart Traill said Tim Nicholls needed to come clean on the LNP’s plan to pay for these commitments, as Queenslanders were fearing the worst. 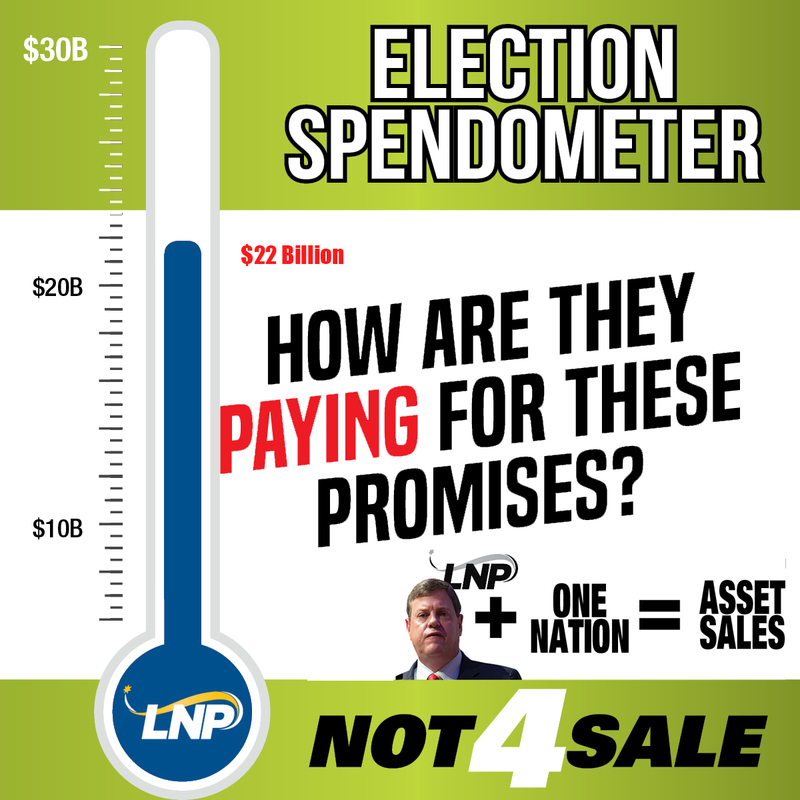 “At the last election Tim Nicholls was saying asset sales were the only way for the LNP to pay for their promises unless Queenslanders wanted cut to services and jobs, or taxes to be raised,” he said. “Yet here he is less than three years later refusing to say how he will pay for more than $22 Billion worth of campaign promises. “We know that he was part of a government that lied to voters in at the last election about there being no jobs cuts, then they got in and sacked over 18,000 public servants. Mr Traill said voters could not trust Mr Nicholls with the fate of their assets as privatisation was in the LNP’s DNA. “Tim Nicholls was the architect of the Newman Government’s Strong Choices campaign to sell Queensland’s power networks at the last election. Who can seriously trust he won’t try it again?” he said. The community campaign credited with toppling Campbell Newman’s one-term Government will kick off again in Brisbane’s northern suburbs tomorrow by warning residents of the threat a LNP and One Nation Coalition government would pose to Queensland assets. The Not4Sale community campaign successfully stopped the LNP Government’s plans to “lease” public assets at the last Queensland election in 2015. Now the architect of those privatisation plans, Newman’s Treasurer Tim Nicholls, is leading the LNP into the upcoming state election. Electrical Trades Union Organiser Stuart Traill said the Not4Sale campaign would remind voters Mr Nicholls could not be trusted to protect the state’s assets, as he had long been an advocate of privatisation. “Tim Nicholls stood infront of the Queensland public as Treasurer three years ago and advocated for the privatisation of the state’s electricity assets as the only way forward for Queensland,” Mr Traill said. Mr Traill said it was incredibly concerning the leadership team of the One Nation party – Steve Dickson and Sam Cox – were two former LNP MPs who had also advocated for asset sales while they were Members of the Newman Government. “It is clear both One Nation and the LNP cannot be trusted to protect Queensland’s assets,” he said. 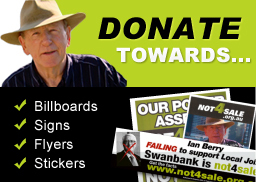 Not4Sale campaigners will be speaking to residents in Kurwongbah tomorrow about the threat both parties pose to Queensland’s assets, Mr Traill said. The Not4Sale campaign has warned Queensland voters to be wary of weasel words employed by proponents of privatisation looking to advocate for asset sales in the lead up to the State Election. A report in The Australian newspaper today said Infrastructure Partnerships Australia and the Infrastructure Association of Queensland had polled Queensland voters on the option of “asset recycling” to raise funds for infrastructure, as a softer term to sell privatisation. The term echoes the efforts of the former Newman Government’s Treasurer Tim Nicholls to rebrand asset sales as “asset leasing” in order to make privatisation more palatable to Queenslanders. ETU Electricity Supply Industry Coordinator Stuart Traill said “asset recycling” was just another weasel word which wouldn’t wash with Queenslanders who had consistently rejected privatisation. “We saw at the last election that no matter how the LNP sell privatisation to Queenslanders the voters reject asset sales,” he said. “This issue was poison for the Bligh Government and it was poison for the Newman Government, and it will be poison for any political party who wants to push asset sales. “No matter if the LNP package privatisation ‘asset sales’ or ‘asset leasing’ ordinary Queenslanders will vote to keep their public properties in Queensland hands. Already it seems asset recycling is failing to be the neoliberal solution to finally achieving privatisation in Queensland. Despite The Australian article claiming support was “growing” for asset sales, the poll showed less than one fifth of respondents favoured asset recycling as an option to raise funds for infrastructure funding. The Electrical Trades Union says One Nation are preparing to betray Queensland voters on asset sales by recruiting yet another Newman Government MP who supported Tim Nicholls’ Strong Choices campaign. Former Logan MP Michael Pucci became the fourth former LNP MP to jump ship to One Nation in the lead up to the state election when he resigned his LNP membership this week to became One Nation’s campaign director. Electrical Trades Union Supply Industry Organiser Stuart Traill said Mr Pucci publicly endorsed the Strong Choices campaign in the lead up to the 2015 election, going so far as to hold a forum in his electorate advocating the privatisation of state electricity assets. Mr Traill said the recruitment of Mr Pucci, as well as fellow former LNP MPs Sam Cox, Steve Dickson and Neil Symes, indicated One Nation were willing to compromise their stance on privatisation in order to prepare for a power sharing arrangement with the LNP. “As we have seen in the Federal Parliament One Nation say one thing before an election and do another once they get elected,” Mr Traill said. “You need to look no further than their support of selling a third of the Kidman cattle station portfolio to Chinese company Shanghai CRED last year, despite their claims to be against foreign ownership. “And here they are running candidates and recruiting political operatives who have publicly campaigned for asset sales while the party claims to be against privatisation. The Electrical Trades Union has warned that South Australia’s vulnerable power network is a preview of the kind of fragile system Queenslanders can expect in place under LNP plans to privatise state electricity assets. The entire state of South Australia went into blackout over night when the state’s power network, operated by Hong Kong based private company Cheung Kong Infrastructure Holdings under the name SA Power Networks, failed due to damage to a single piece of infrastructure. South Australian energy customers have since taken to social media angry at paying the highest electricity prices in Australia despite poor service delivery. ETU Queensland and NT Energy Supply Industry Organiser Stuart Traill said the blackout was a preview of the kind of electricity network Tim Nicholls and the LNP would like to see in Queensland. “This is exactly the kind of vulnerable network we can expect in Queensland if Tim Nicholls has his way and sells off our electricity assets,” he said. “Queenslanders can expect the highest energy prices for the weakest, most vulnerable infrastructure. Mr Traill said he hoped Mr Nicholls, the architect of the LNP’s unsuccessful asset sales campaign at the 2015 Queensland Election, would think twice about his privatisation plans in light of the blackout. “As this blackout in South Australia has shown the maintenance of our electricity network is too important to be compromised by bean counters from private enterprise,” he said. “Even Federal Environment and Energy Minister Josh Frydenberg has said the situation in South Australia is ‘clearly not adequate’. The Electrical Trades Union today called into question One Nation’s anti-privatisation platform following the party’s recruitment of an LNP MP prominent in the Newman Government’s Strong Choices campaign. Member for Buderim Steve Dickson today switched from the Liberal National Party to One Nation, to become the sole member of Pauline Hanson’s party in Queensland Parliament. A Minister in the Newman Government, Mr Dickson argued heavily in the lead up to the 2015 election for voters to embrace Tim Nicholls’ privatisation campaign. But in October last year Mr Dickson stated he went along with the LNP’s position despite not personally supporting the sale of public assets. Electrical Trades Union Queensland and NT Acting Secretary Peter Ong said the recruitment of an MP who had already cast aside his principles to support the LNP’s privatisation agenda showed One Nation could not be trusted to protect assets. “As we saw in Federal politics, One Nation talk a lot of talk about how they will represent the interests of working people but when they get into parliament they sell out those very same people by backing LNP legislation,” Mr Ong said. “Steve Dickson has already put aside his own personal views on privatisation to appease the LNP once before – no doubt we can expect he and other potential One Nation MPs to sell out Queenslanders again to serve their Liberal friends. Mr Ong said Mr Dickson’s move was not surprising considering how much the LNP and One Nation were beginning to resemble each other. “One Nation senators in the Federal Government voted with the Turnbull Government more than 80% of the time last year,” he said. Deciding the ridicule he was bombarded with at the 2015 State Election was not enough, the LNP party room have forced Mr Strong Choices, Tim Nicholls, to reluctantly lead them to the Opposition’s next election loss. Mr Nicholls, the architect of the LNP’s unsuccessful asset sales campaign at the 2015 Queensland Election, dubbed “Strong Choices”, defeated experienced election loser Lawrence Springborg in the party room ballot this morning. Since announcing his plans to contest the LNP leadership on Thursday, Mr Nicholls has attempted to distance himself from the LNP’s unpopular asset sales agenda. But ETU State Secretary Peter Simpson said Mr Nicholls’ comments could not be trusted. “It has been funny to watch the shambles that is the LNP unravel in the public eye over the past week, but make no mistake the LNP’s agenda of privatisation is deadly serious,” he said. “Mr Nicholls may have ‘reluctantly’ taken on the role as LNP leader but he won’t be reluctant in embracing the asset sales agenda Mr Springborg and his allies at the Courier Mail have pushed this year. “It is in the LNP’s DNA to sell off private assets. That’s why no pledge from an LNP leader on asset sales can be trusted.